In Hylton v United States, the U.S. Supreme Court upheld an annual tax on carriages was a valid exercise of Congress’ constitutional authority. It specifically ruled that the tax was not a direct tax that required compliance with Article 1’s requirements for the apportioning of direct taxes. In 1794, Congress enacted a law entitled “An act to lay duties upon carriages for the conveyance of persons.” The statute levied a tax of sixteen dollars on each carriage owned by an individual or business. Daniel Hylton challenged the constitutionality of the law, arguing that it was a direct tax that had not been apportioned in accordance with Article 1. 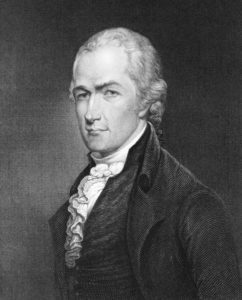 Alexander Hamilton, argued on behalf of the government before the U.S. Supreme Court. The Court upheld the tax. As was the custom at the time, each of the justice wrote separately. The case was the first to address the constitutionality of an act of Congress. However, because the law was ultimately upheld, it is not regarded with the same significance as the Court’s later decision in Marbury v. Madison.